Without a doubt, this has been the most representative book by Dani DaOrtiz. 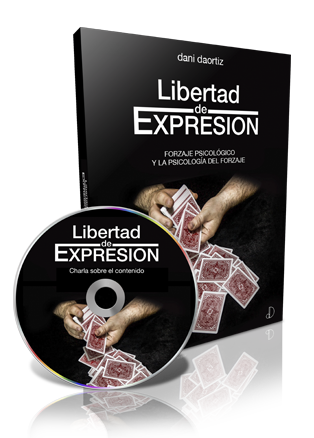 Its first edition was back in 2009, and surprised all lovers of cardmagic, for its approach from the point of view of the viewer (as we have often heard the author). A book that perfectly describes the conception of Dani, and with which many magicians have grown and improved their perception of psychological forcing. Through almost 140 pages of information, Dani undresses artistically and mentally, offering all her psychological weapons and placing them within the reach of everyone. Exhausted for almost two years, now, we present a new edition, more careful, corrected, which has incorporated photos instead of drawings, and has included a DVD with a talk by Dani about its content. Estudio sobre el forzaje clásico (psicológico). Force numbers, letters, colors, choices... Get into the brain of the spectator and manipulate it at your whim. Dani will not only teach you how, but he will offer you an array of techniques and games so you can rehearse it. The spectators, without knowing it, will be Frequently forced. Welcome to the world of Dani. A Best Seller, now with Digital DVD. Since its first edition, this has been one of the best-selling Spanish books. Occupying the bookstores of a thousand of passionate about magic, this new edition leaves a space for the new Digital DVD, recorded for the occasion. A Digital DVD in which Dani talks to us about the content of the book, making some samples, and inquiring into some interesting topics such as attitude, personality, rhythm, etc. All aspects that will help, without a doubt, to better understand this work.